We recently had two very cold frosts out at Black Butte Ranch, which seems a little early, we lost our tomatoes but I was able to pick a bunch of squash and I picked all of the blossoms for stuffing. 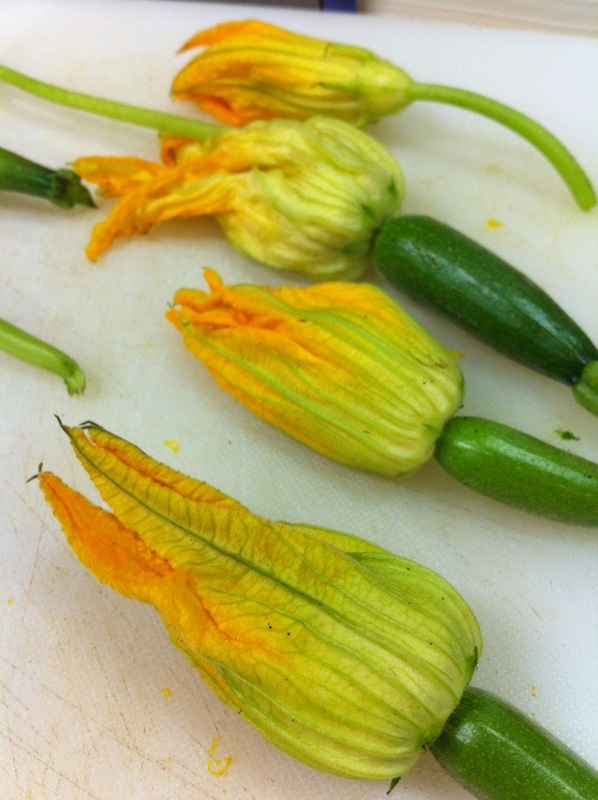 Squash blossoms have great flavor and are very easy to deal with, they can be stuffed, tempura fried, or my staffs favorite, folded in a cheese quesadilla. My favorite preparation is stuffed then tempura fried, a light tempura batter is key so you don’t mask any of the flavors, which can be very light. For this recipe, I stuffed it with two types of cheeses and some strong spices to help the filling stand out, as well as some cocoa nibs to balance and add crunch to the filling. Using a spray can duster or the big lungs you have blow off as much dirt as you can, you do not want to rinse in water as they will get soggy. Combine all of the ingredients above and fold together with a spatula, if you use a mixer you might break the mascarpone, so it is safer to mix by hand. Place the filling in a piping bag or a Ziploc bag and cut a hole in the bottom to squeeze it out of. Carefully open the flowers and stuff them until they are half full. Once stuffed, set aside and prepare the tempura. I wanted to keep the dish gluten-free so I used cornstarch and garbanzo bean flour. The cornstarch will ensure that you have a very nice and crisp coating, the garbanzo bean flour will add flavor. 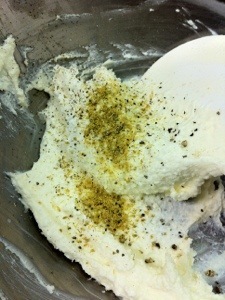 Combine the cornstarch and garbanzo bean flour and mix. 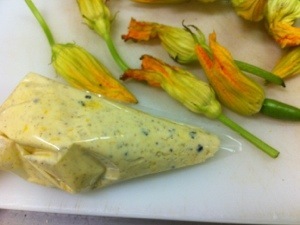 Stream in the soda water until you have a thin batter, the batter should be thick enough to just coat the blossoms. 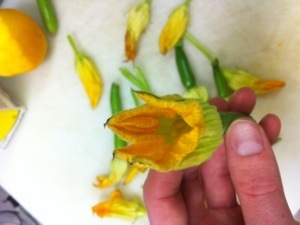 Set your fryer to 350° and once heated dip your blossoms then fry, you may need to weigh them down as they will float. 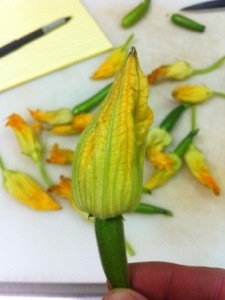 I used them as a garnish on our pork chop dish.